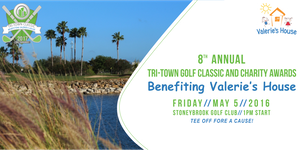 FORT MYERS, Fla. - March 10, 2017 - PRLog -- The 8th Annual Tri-Town Classic Golf Tournament & Charitable Awards will be held Friday, May 5, 2017 at Stoneybrook Country Club at 21251 Stoneybrook Golf Blvd, Estero, FL 33928. The annual golf tournament is presented by Tri-Town Construction, LLC to benefit area children. Proceeds from this year's event will go to Valerie's House, grief counseling programs for children who have lost a parent or sibling. Tri-Town Classic Charitable Awards will recognize area individuals and businesses who make charity an integral part of their fabric. Nominations are open for Most Charitable Large Business, Most Charitable Small Business, Community Volunteer of the Year, Student Volunteer of the Year, and the Tara Parla Passion Award to an individual who, out of their own crisis, rose up to help others through education, support, prevention, or otherwise. To apply for or nominate an individual or organization, go to www.SurveyMonkey.com/r/R3XG8DT. Deadline is April 9. Sponsorship opportunities are a way for businesses to visibly support charitable work in the community. Available sponsorships: Hole in One ($3,500); Shirt Sponsor ($2,500); Sweet Spot ($1,500); Angel Sponsor ($700); Beverage Sponsor ($500); and Par Hole Sponsor ($200). The after party will feature Memory Markers that are available for $100 each to memorialize the story of a Valerie's House child. Valerie's House donations are also welcome. To donate or become a sponsor, contact Brandie Dickerson at (239) 826-4307 or Brandie@Tri-TownConstruction.com. The four-person scramble format golf tournament will kick off with check-in and lunch at 11:30 a.m. - 12:30 p.m., followed by a 1:00 p.m. shotgun start. An after party at Duffy's at 21253 Stoneybrook Golf Blvd. follows the tournament. Golfers will relax and enjoy dinner and drinks, a live band, golf awards, and celebrate the winners of the Tri-Town Classic Charitable Awards. Tickets for the 8th Annual Tri-Town Classic Golf Tournament can be purchased at https://goo.gl/oEoKW5. Four Players - $520; Individual Player - $130 ea. Includes lunch and after party dinner, t-shirt; gift bag, and sponsored hole giveaways. Valerie's House is now serving more than 105 children and their families from Lee, Collier, Charlotte, and Hendry counties. Meetings are held at 1618 Avalon Place in Fort Myers and at two satellite locations: Cape Christian Church, 2110 Chiquita Blvd S. in Cape Coral and at The Village School at 6000 Goodlette-Frank Road in Naples. For more information, visit www.ValeriesHouseSWFL.org or contact Danielle Visone, MSW at (239) 841-9186 or at Danielle@ValeriesHouseSWFL.org. Tri-Town Construction LLC is a fully licensed and insured general contractor and roofing contractor based in Southwest Florida. It specializes in residential and commercial construction with an emphasis on remodeling, as well as emergency response services for mold, water, and fire. For more information, visit www.Tri-TownConstruction.com or call (239) 895-2058.